My old man, brother, and I have been going up to the Adirondacks of New York since we were youngsters. It is where I first picked up a fly rod. My father joined an old fishing and hunting club up there when I was sprouting my first man hair, and we have been doing trips together at least once a year ever since. I even convinced my now wife to get married up at the club last year. A magical place indeed. Unfortunately, with his recent retirement and 2 new grand kids my pops decided it was about time to give up the ol' membership. So the three boys headed up for one last horrah. After an afternoon of day drinking, the winds die down and my brother and I return to our abandoned boat. 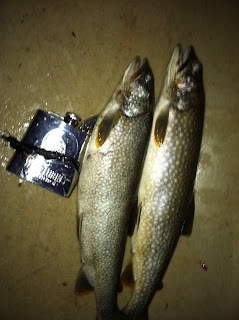 We rip some streamers for a couple hours and manage to pull in 2 descent lakers by the days end. The killa. Proud of this one. The second day we headed out to a pond in the middle of absolutely nowhere, again fighting rain the whole way. A an absolutely beautiful place though that hardly gets touched and produces good numbers of brookies. We had to row across one lake to get to the trail to then hike into our fishing lake. Leaving the boat, heading out on the trail. I was able to get my old man into some fish which was pretty cool to be a part of (he's still pretty novice after all these years). Ended up landing a dozen or so between the three of us. 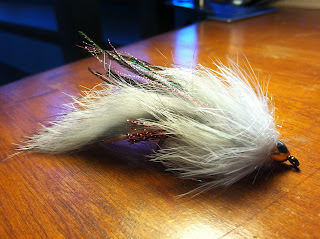 My father dreams about eating trout out in the wild, so we kept a couple tasty critters for lunch. Awesome weekend. Place will be missed. thanks for sharing bill. it's nice to have places like that. Nice fish Bill. Well done dredging out those lake trout. Never done anything like that before myself. Damn...you should do whatever possible to keep the club membership in your blood line. I'm sure you already know this but, you will regret this departure from your club. I feel your pain. Beautiful spots on that brookie Gasman. Great story and great memories all around. Love that fly....looks like it'd be a killer on the browns and bows around here. Those are some beautiful fish and maybe even better scenery. Looks like the kind of place a guy wouldn't want to leave.